An apartment on the Mediterranean? A house in the Pyrenees? Your choice of holidays in the South of France! Please note that both properties are non-smoking; but pets are welcome!! The Pyrenees-Orientales is in the far south of France, bordered by the Mediterranean Sea and the Pyrenees mountains. Here people remain proud of their traditions, still speaking Catalan, the language of both the tiny independent state of Andorra and northern Spain, their neighbours. Admire the beautiful scenery ranging from high snow-capped peaks to miles of safe, sandy beaches - as well as valleys, lakes, rolling hills and rocky coves. 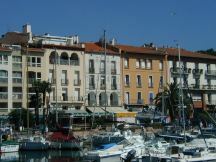 Or have a day in Perpignan with its pavement cafes and medieval centre; take a mountain trip on The Little Yellow Train; see the nearby Cathar Castles or the 450,000 years old Tautavel Man. As for sports, everything you could possibly want is probably here - skiing, both Alpine and cross-country, swimming, walking, horse riding, microlight flying, go-karting, golf, cycling, climbing, fishing - under a glorious southern sun (300 days per year, according to official records). Not to mention wonderful food and wines - this is one of the largest areas of wine production in France - in reasonably priced restaurants, many offering freshly caught fish straight out of the Mediterranean. Or have a "back-to-back" holiday - a week in the mountains and a week by the Mediterranean? This can sometimes be arranged, especially out of the High Season. E-mail for availability. Ceret - its modern art museum, with works by Picasso. Our private home in Caixas has a web site here.